One of the best fights on the stacked UFC 225 card is being completely buried on the Fight Pass prelims. It's not even the Fight Pass main event; it's just buried on the card, instead of being on pay-per-view like it should be, or at least on the FS1 television prelims. The UFC has instead decided to put top flyweight contenders Joseph Benavidez and Sergio Pettis at the bottom of UFC 225. And it's a damn shame, because this could be one of the best fights on a card chock full of them. It's a complete joke that a quality fight like this is being buried so far down the card when there were clearly other opportunities to place it further up the card. On the pay-per-view, for instance, CM Punk takes on Mike Jackson in what is essentially a freakshow fight. Benavidez vs. Pettis would have worked well as the PPV opener, but instead it's on Fight Pass. If your argument is that Punk sells PPVs, ok, fine. But then why is a crappy heavyweight fight like Rashad Coulter vs. Chris De La Rocha opening the FS1 prelims? Even the Fight Pass headliner between Rashad Evans and Anthony Smith is less relevant than Benavidez vs. Pettis. It makes no sense that this fight is so far down the card. What other #1-ranked contender has ever fought so low on a card before? Benavidez himself made this point in a pre-fight media interview last week. He openly questioned why the UFC is sticking him and Pettis so far down the card when the winner could very well be fighting for a title shot against UFC Flyweight Champion Demetrious Johnson next. Of course, maybe that's why. Maybe the UFC is punishing the flyweight division because Johnson doesn't sell PPVs. Maybe the UFC is slowly trying to phase out the division. Regardless, the fact that such a great fight like Benavidez vs. Pettis is being stuck way down the bout order is a damn shame, as it's a great fight between two winning fighters. 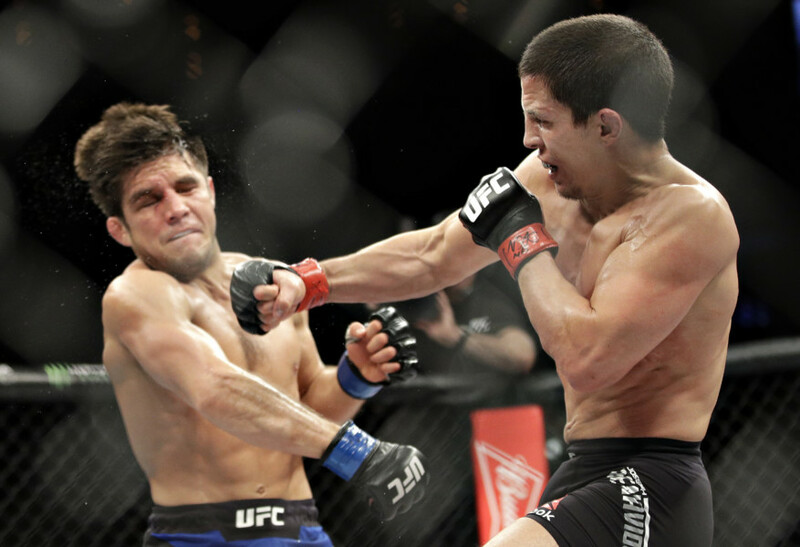 Benavidez has won six straight fights, and beat Henry Cejudo in his last fight. He hasn't fought in over a year due to injuries, but you'd be hard-pressed to find someone who still doesn't consider him second in the world to Johnson amongst flyweights. Even though Pettis lost to Cejudo in his last fight, he's still very relevant in the flyweight division. You'd think the UFC would want to promote this fight and try to give the winner a push, as he could very well be next in line for "Mighty Mouse," but nope, the fight is just being ignored and hasn't been promoted at all. And that's pretty sad. 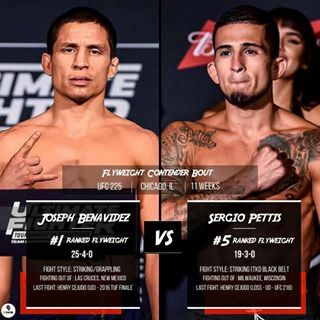 I really hope Benavidez and Pettis go out there and put on an amazing fight to show the UFC brass they made a huge mistake putting these guys so far down in the bout order. Both guys have been good soldiers in the Octagon and deserved a more prominent position on the card. Yes the card is stacked, but then again there are plenty of Fight Night cards that Benavidez and Pettis would have made more sense being put on as co-main event. But nope, the UFC decided to bury them. I don't know if the UFC is sending a message to the fighters in the flyweight division or what, but hopefully these fighters go out there and show why they deserved a much more prominent spot on the card UFC 225 bout order.